Arthritis is becoming a more and more widespread musculoskeletal disease that affects the joints as well as the spine. With over 150 established musculoskeletal conditions that cause stiffness, chronic joint pain and body aching. The most frequent are known as Osteoarthritis and Rheumatoid. 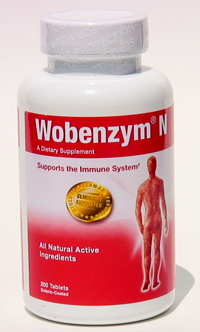 Wobenzym, also known as Wobenzym N, is a combination of enzymes, intended to offer pain relief from arthritis and a treatment from osteoarthritis, along with many other health benefits. It is estimated by the World Health Organization that 9.6% of men and 18% of women all over the world aged 60 or over experience symptomic osteoarthritis. Around 25% of people are not able to carry out key daily tasks. Conventional treatment costs can prove expensive in the long run in addition to the unbearable pain endured by most arthritis sufferers. Many people look for the newest or the most conventional medical wonders. However it is worth bearing in mind other options when beating this disease. Enzyme preparation Wobenzym N has been used in Europe from the 1960s. As a natural anti-inflammatory drug it was formerly used for the treatment of osteoarthritis. Wobenzym is also widely popular among Olympic athletes to lower the pain of injuries by as much as 50% whilst improving healing and is commonly being used to stop bruising and puffiness in patients after surgery.